"No sooner is Shawn Collins home from the fighting in Europe than he is called upon to serve his country in another way--as a speaker on the war bond tour. ..... Shawn just wants to stay home with his son Patrick and the aging father with whom he has finally reconciled. When Shawn taps Katherine Townsend to be Patrick's nanny while he's on the road, he has no idea that she will be the key to his future happiness and the mending of his heart." With that premise, Dan Walsh opens his newest novel, The Homecoming, at the end of his first book - The Unfinished Gift. Initially, Walsh did not plan to write The Homecoming, but things changed and he realized there was another story to tell. "I realized I wasn’t ready to leave these characters behind; they had become almost like an extended family to me," Walsh said. "I could see there was at least one more story to tell. This time, a love story. Using that input, Walsh began to craft a story that hopefully included an "enjoyable love story." "I also wanted to communicate something of the goodness of God, and how God’s love and goodness to us is still present and working, even during dark and disappointing times," he said. The Homecoming picks up shortly after Shawn Collins' return to the states. The story line follows the remaining years of the war - and encompasses Collins' relationship with Katherine. Walsh said it natural to conclude The Homecoming at the end of World War II. "It just fit," Walsh said. "I needed an adequate length of time for the necessary elements in the story to come together. It worked for that reason. But it also worked in terms of providing a big backdrop for the story’s climax." In the novel, Collins goes on a bond tour - to appear with Hollywood "royalty" in an effort to raise money for the war effort. Walsh said he tried to authentically portray this piece of history with his descriptions of the tours. "This was perhaps the most challenging section of research for the book," Walsh said. "I read at least a dozen books about life on the homefront during WWII. All of them spoke of these War Bond tours, but none in detail. "Once again, the internet came through. It’s an amazing resource for research. I found numerous articles, even whole sections of books no longer in print, about these tours. What you see in The Homecoming is as accurate as I could make it, given it is still a work of fiction." Walsh said the War Bond tours were an absolute necessity for the American war effort. "America has been a superpower for so long, it’s hard to fathom that we were once a minor player on the world’s stage," Walsh explained. "Before the attack on Pearl Harbor, we had almost no money devoted to defense in our national budget. No way to pay for all the manpower, weapons and equipment needed to fight the war. "Raising money was the primary reason for these tours, not stirring patriotism, although it accomplished both. I don’t see it happening again, mainly because defense has become a huge and permanent part of our national budget." During the novel, as a sub-theme, Walsh has Katherine experience a worship service while taking Patrick to a church. Again, he utilized research to help portray what life was like during WWII. "I know my readers go to a wide variety of different Christian churches. I didn’t want to feature one over the others, so I decided on a church that simply got the main things right: Loving God, sharing the gospel and caring for others," Walsh explained. "My research showed that, unlike today, the overwhelming majority of Americans attended church regularly during WWII. Faith was a very common aspect of social life." Having Katherine explore what it meant to be a Christian, Walsh said, was an important aspect of The Homecoming. "It was apparent in The Unfinished Gift that Katherine―though a wonderful lady―was not a Christian and faith was not a big part of her life," Walsh said. "But it was for Shawn and Patrick. Someone like Shawn, whose faith was central to his life, would have resisted opening his heart to pursue someone who had no interest in the Christian faith." 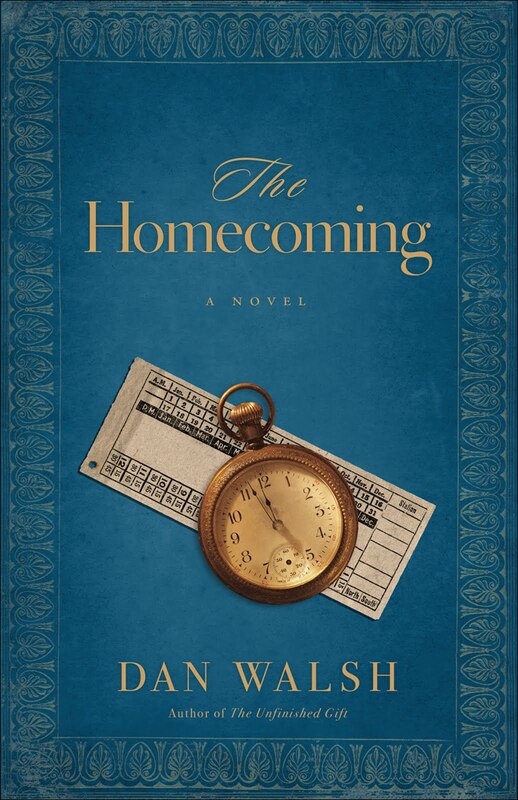 In all, Walsh hopes readers not only enjoy The Homecoming, but become "totally immersed in the lives of the characters" he has come to love. "After reading the book, bestselling author Colleen Coble called it, 'One of the most touching and delightful love stories I’ve ever read.'" Walsh said. "I hope every reader feels the same thing Colleen said when they finish the last page. "On a more spiritual level, there are some strong themes in the book about the goodness of God and learning to trust Him again when your hopes and dreams have been shattered." Walsh believes readers are drawn to novels set during WWII for a variety of reasons. "I think it’s because our country is in a mess right now, polarized, divided, complex and filled with uncertainty," Walsh said. "Books about WWII transport us back to a simpler time when our country made a whole lot more sense. "The war created a great deal of uncertainty but, as a country, we faced the challenges it created together." --There really is an Eagle at Wanamaker’s in downtown Philadelphia. (The store is now owned by Macy's). You can see a photo of the statue by clicking here. "Actually, if you Google “Wanamaker Eagle” there are dozens of sites about it," Walsh said. "The main reason I chose it as a landmark is that I needed a place for Shawn and Katherine to rendezvous in downtown Philly. "My mother met and fell in love with my Dad in downtown Philly. I simply asked her if she and my Dad were going to meet somewhere downtown, where would it be? Without hesitation, she said, 'We’d meet at the Eagle.'" ---Originally, Walsh thought he might call the book "Meet me at the Eagle," thinking to use it the same way the Empire State Building is used in Sleepless in Seattle and An Affair to Remember. "My editors felt that the title wouldn’t work, because no one would know what I’m talking about unless they lived in Philly," he explained. The Deepest Waters - Walsh's next novel - should appear on bookshelves in the spring of 2011. The novel begins a new storyline, set in 1857, about a couple separated by a shipwreck on their honeymoon voyage from San Francisco to New York. While it is a fictional tale, Walsh said more than half of the things that happen in the book are true - "and they are amazing." "My wife loved The Deepest Waters even more than my first two books," Walsh said. "Revell has just sent the cover for the book for my approval. It is incredible. I can’t wait for it to come out." As of now, The Deepest Waters is the first of a new three-book deal, Walsh has with Revell. "While not ruling out a sequel, right now, they are asking me to write 3 stand-alone novels." His fourth book - a work in progress right now - is tentatively titled The Book Nook, and is another Christmas novel, this time set in 1980 in an "enchanted little bookstore" owned and operated by Art and Leanne Bell. It, he said, contains a "host of charming and eccentric characters, whose lives have been forever changed…at The Book Nook." I really liked The Homecoming. Walsh said readers may be drawn to novels set during WWII because the books draw us back to a simpler time. I think one of the things I like about The Homecoming (and The Unfinished Gift) is that life was simple, but yet contained enormous depth. Ok, let's face it, I "knew" as soon as I read the "pre-release" info, that this book would include a love story between Shawn and Katherine - so it was a bit like knowing what the "last pages" said before you start the book. However, the storyline was enjoyable and frankly, peaceful. In a world filled with TV shows & novels with themes "ripped from the headlines" the story was like a refreshing drink of cold water on a hot day. I think I described The Unfinished Gift like a cup of "written" chicken soup. If that's the case, then The Homecoming is a bit like a slice of my grandma's chocolate cake - sweet and rich, yet incredibly simple and delicious. On a scale of one to five, with five being the highest, I'd give this book at least a 3.5 to 4. I think you'll enjoy Walsh's writing style and how he develops his characters. You may find yourself reading the descriptions of the war bond tour and wanting to find out more of this piece of history. In recent family news, Walsh's daughter is now married, and his son recently became engaged. "[My wife and I are] looking forward to the possibility of becoming grandparents in the next few years," Walsh explained. His Favorite Character in this series? : Mrs. Fortini, the Italian grandmother who lives next door. If you read the book...how can you not like her? 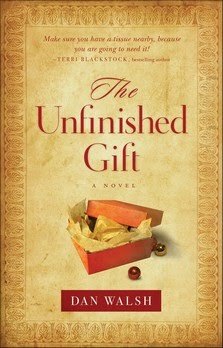 Want to read more about The Unfinished Gift? Click here for a review and earlier interview. The Unfinished Gift is set in 1943, a week before Christmas. Patrick’s mother has recently died in a car accident and he is being sent across town to stay with a grandfather he’s never met while the Army tries to locate his father, a bomber pilot in England. Patrick’s father and grandfather haven’t spoken since before Patrick was born. The book explores the surprising things God uses to affect powerful changes in our hearts; like a little boy’s prayers, a shoebox full of love letters, and an old wooden soldier collecting dust in a grandfather’s attic. I love what you did here, reads like a nice interview in a magazine vs a straight Q & A approach. Thanks so much for being a part of the blog tour. So glad you enjoyed the book.